A white field with a centered red cross; in the centre of each quarter is a red Bolnur-Katskhuri cross. The flag of Georgia (Georgian: საქართველოს სახელმწიფო დროშა; sakartvelos sakhelmtsʼipo drosha), also known as the Five Cross Flag (Georgian: ხუთჯვრიანი დროშა; khutjvriani drosha), is one of the national symbols of Georgia. Originally a banner of the medieval Kingdom of Georgia, it was brought back to popular use in the late 20th and early 21st centuries during periods of the Georgian national revival. Prior to obtaining its official status in 2004, the flag was popularized by the United National Movement and served as one of the most recognisable symbols of the Rose Revolution. The current flag was used by the Georgian patriotic movement following the country's independence from the Soviet Union in 1991. By the late 1990s, the design had become widely known as the Georgian historical national flag as vexillologists had pointed out the red-on-white Jerusalem cross shown as the flag of Tbilisi in a 14th-century map by Domenico and Francesco Pizzigano. A majority of Georgians, including the influential Catholicos-Patriarch of the Georgian Orthodox Church, supported the restoration of the flag and in 1999 the Parliament of Georgia passed a bill to change the flag. However, it was not endorsed by the President, Eduard Shevardnadze. It was adopted in the early 2000s by the main opposition party, the United National Movement led by Mikheil Saakashvili, as a symbol of popular resistance to Shevardnadze's rule. The flag was adopted by Parliament on 14 January 2004. Saakashvili formally endorsed it via Presidential Decree No. 31 signed on 25 January, following his election as President. 14 January is annually marked as a Flag Day in Georgia. The Georgian national flag is a white rectangle, with in its central portion a large red cross touching all four sides of the flag. In the four corners there are four bolnur-katskhuri crosses (Also refer as Georgian Crosses aside with Grapevine cross) of the same colour (as the large cross). The five crosses on the current Georgian flag are sometimes interpreted as representing either the Five Holy Wounds, or alternatively Christ and the Four Evangelists. The first Georgian flag design came about during the era of the early Georgian state, the Principality of Iberia which had a red cross against a white background, similar to the flag of England). The subsequent Principality of Tao-Klarjeti, shared this same flag. The flag of the Kingdom of Abkhazia had 4 green strips in a dextral position on the right side, while the left side contained the cross seen on the current Georgian flag. The white flag with the single red St. George's cross was supposedly used by King Vakhtang I in the 5th century. [dubious – discuss] According to tradition, Queen Tamar (d. 1213) used a flag with a dark red cross and a star in a white field. In the 1367 map by Domenico and Francesco Pizzigano, the flag of Tifilis (Tbilisi) is shown as a Jerusalem cross (a large cross with smaller crosses in each quarter). According to D. Kldiashvili (1997), the Jerusalem cross might have been adopted during the reign of King George V.
After the collapse of the Kingdom of Georgia, its successor states adopted their own flags, with most of them using animals as their representative symbols. The kingdom was formed through the unification of Kartli and Kakheti. The flag had a white cross against a black background. The country lost its independence in 1801 to annexation by the Russian Empire. While not technically a Georgian flag, this flag is of importance as Georgia was one of the founding countries of the federation. The Transcaucasian Democratic Federative Republic's flag was a tricolour design, with a top band of dark yellow, a middle band of black, and a bottom band of red. During Georgia's brief existence as an independent state as the Democratic Republic of Georgia from 1918 to 1921, a tricolour was adopted. The design resulted from a national flag-designing contest won by the painter Iakob Nikoladze. It was abolished by the Soviet Union following the 1921 incorporation of Georgia into the USSR. During the Soviet period, Georgia adopted several variants of the red Soviet flag incorporating either the Georgian Soviet Socialist Republic's name, or a red hammer and sickle with a star in a blue sun in the canton and a blue bar in the upper part of flag. The flag of the Georgian SSR was abolished by the Georgian government in November 1990 shortly before it declared independence from the Soviet Union. The previous flag used by the Democratic Republic of Georgia from 1918 to 1921 was revived on 8 December 1991, by the Supreme Council of the Republic of Georgia. However, it lost popularity thereafter as it became associated with the chaotic and violent period around the collapse of the Soviet Union. The wine-red colour symbolises the good times in the past and the future, while the black represents Russian rule, and the white represents hope for peace. ^ Decree of the President of Georgia No. 32 of 25 January 2004. ^ "A majority of Georgians, including the patriarch of the Georgian Orthodox Church, have long favored adopting the five-cross banner as the nation's official flag. But the outgoing president stymied all efforts to make the change. In 1999, the Georgian Parliament voted to change the flag, and all Shevardnadze had to do was issue a supportive Decree. Inexplicably, he refused to do so, instead setting up a powerless Heraldic Commission to study the matter. When Saakashvili founded the National Movement in 2001, therefore, the five-cross flag was the natural choice to illustrate his party's populist bent." Brendan Koerner, "What's With Georgia's Flags? ", Slate, 25 November 2003. ^ a b "Georgia celebrates National Flag Day today". Agenda.ge. 14 Jan 2017. ^ Michael Spilling, Winnie Wong: Georgia p. 37. ^ Theodore E. Dowling, Sketches of Georgian Church History, New York, p 54. D.M.Lang – Georgia in the Reign of Giorgi the Brilliant (1314–1346). Bulletin of the School of Oriental and African Studies, University of London, Vol. 17, No. 1 (1955), p. 84. G. Macharashwili დროშა გორგასლიანი, თბ. 2011. ^ "Georgia". Encyclopædia Britannica. Retrieved 2013-02-14. .
^ David Kldiashvili, ქართული ჰერალდიკის ისტორია ("History of Georgian heraldry"), Parlamentis utskebani, 1997; pp. 30–35. 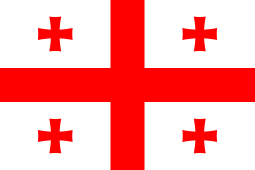 Wikimedia Commons has media related to Flags of Georgia. This page was last edited on 20 February 2019, at 17:28 (UTC).